Lotus & Bug ~ Yoga. Play. Every Day. Announcement We just launched our new website! Visit http://www.lotusandbug.com to see our new collections! We just launched our new website! Visit http://www.lotusandbug.com to see our new collections! we bought most of items, high quality, very comfy, which were different from other brands. Love all of them!! This is a beautiful, high quality t-shirt with stunning colors. Can't wait to order more from this amazing shop! Enter our Summer Of Love Giveaway for a chance to win our girls Peace & Love Yoga Pants! That’s it! The giveaway runs from 12pm 6/22 - 6/30 at 11:59pm EST. We just love seeing smiles on the mat in our Hand Painted leggings! Turn your world upside down with these super soft, ultra comfortable, stretchy yoga pants. Each pair is hand tied and hand dyed with love to create our unique Lotus & Bug striped pattern at the ankle. 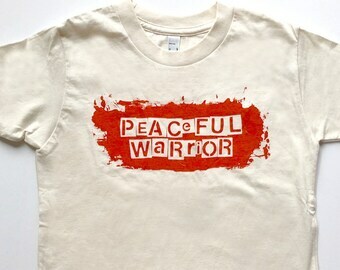 On sale in our online shop for just $15! On location with the Lotus & Bug models. Tie dying in the backyard. Signature Bugs painted one by one. Each pair of leggings is painted by hand, one by one. Welcome to Lotus & Bug! We are a kids clothing brand inspired by yoga, play and the every day! We encourage your kids to be active, brave and kind. 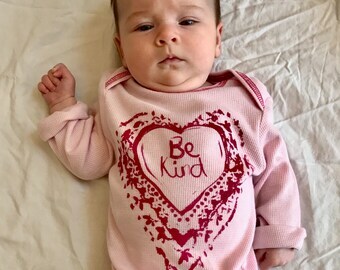 As a mom-owned business, our intention is to promote an active lifestyle and a healthy attitude towards others by creating comfortable clothes for your kids that encourage activity, bravery, and kindness, for infants and kids in sizes 0-14. We also offer limited edition pieces for women and accessories for all. One of the first of its kind, Lotus & Bug designs clothes for yoga, play, and every day. We want to ensure that, whether your kids are on their mats, on the playground, or in school, they will love wearing our clothes as much as we love making them! All of our dyed, painted, printed, and stamped pieces are done by hand—our hands—locally in our New Jersey studios. We thoughtfully produce our designs in small batches, using non-harmful materials. In fact, we try to be mindful in everything we do, from choosing the finest fabrics to printing our hang tags in the U.S. on recycled FSC-certified paper. Our organic cottons, super soft jersey knits, hemp, and bamboo fabrics, paired with vintage trims and hand-sewn details are sure to please grown-ups and kids alike. 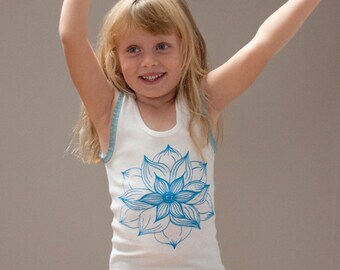 Meditating on their Mandalas or considering their Peaceful Warrior, we hope wearing our collection’s bold, original graphics, and rich, vibrant colors will inspire your kids to be brave, say nice things, and be kinder than necessary—all while enjoying the comfort and ease of our clothing. Our clothes are season-less so they can be layered for chilly days, or worn while transitioning from the yoga studio, soccer practice, or dance class. When your kids outgrow them, pass them on or upcycle them into something new! At Lotus & Bug, we want the clothes to live on. We encourage you and your child to get involved with Lotus & Bug! Be sure to like, follow, pin and tweet us to stay in the loop! Like what you see? Make us a favorite shop right here on Etsy and share with friends! And check out our amazing photographer Kate Albright at www.katealbrightphoto.com. Don’t just wear it, live it! Mary Blackstock has been an artist with a love of fashion since she was four years old. She has been hand painting & designing clothes since she was 16. As co owner at Lotus & Bug, she combines her knowledge of fashion, graphics and yoga. Joanne's career began with emerging trends & designing prints & textiles for the country’s leading children’s wear & women’s wear brands. At Lotus & Bug Joanne combines all her talents: drawing, painting, print, pattern & children's wear design. Prints our designs in sticker format. Because of the handmade nature of our items, all purchases are final sale and not eligible for refund. Items however, can be exchanged within 30 days of purchase. If you need to make an exchange email us at info [!at] lotusandbug.com and once you've received a return authorization from us, simply send the item back in the condition received within 30 days. Please note, the exchanged item must be of equal or greater value than the original purchase. Please be sure to make sure the package is sent with delivery confirmation, as we cannot be responsible for packages lost in the mail. Once we've received your package we will ship out the exchange package. Additional shipping fees apply. We accept all major credit cards and Etsy gift cards. Each item is often handmade upon purchase. Orders usually ship out within 5-7 days. For orders outside the U.S., please contact us. If you would like a different children's size from what is shown, please contact us at info [!at] lotusandbug.com and we would be happy to discuss custom sizing with you. If you are interested in wholesale, please contact us at info [!at] lotusandbug.com. The entire content included in this shop, including but not limited to text and graphics is copyrighted as a collective work under the United States and other copyright laws, and is the property of Lotus & Bug LLC. ALL RIGHTS RESERVED. Reproduction, distribution, display or transmission of the content of this shop's content is strictly prohibited.